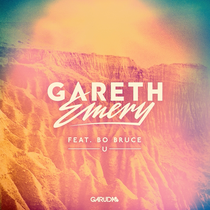 British producer Gareth Emery is back with ‘U’, a brand new song featuring Bo Bruce that’s out today on his own label, Garuda. It’s the first single from his brand new album, ‘Drive’, set for release 1 April and creates an insight into what the forthcoming album has to offer. The track is a love song with ethereal vocals and euphoric synths combined to create a nice slab of music. The pop-inspired melodies paired with vocals by Bo Bruce - a second place contestant from The Voice (UK) - creates an uplifting, emotive sound, before dropping into Emery’s signature electro synths. The track comes with a video directed and produced by Alex Maxwell at The Mill. Making its debut today, it features a young couple, hopelessly in love, trekking down through the American countryside. Along with appearances from both Bo and Gareth, the video captures the perfect summer romance. Gareth has created a blend of trance, house and electro that he uses to build his melody-focused club tracks that form his greatest successes, which include a long-running podcast series and his own label Garuda. Stateside, Gareth will appear at Ultra Music Festival in March and make his Coachella festival debut this April. Check the video for ‘U’ below.